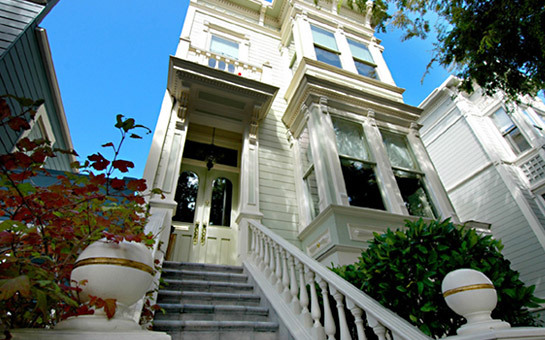 The classic Eastlake/Stick Victorian features a handsome staircase with ball turn posts and columned portico with glass lantern and balustrade overhead. Colonettes flank the tall square bay windows with decorative panels; dentil moldings complete the fine detailing of this classic façade. All the modern conveniences for city living have been skillfully integrated with the period character of the interior, in particular, the well-proportioned rooms with tall ceilings, doorways & windows, moldings, rosettes, corbels & wainscots, period & recessed lighting and handsome hardwood floors throughout. Enter through tall double doors with arched glass panes & transom to the light-filled FOYER with elegant chandelier. The gracious staircase has a black enameled banister with carved wood post and carpeted leopard runner. An exquisite oval skylight at the top provides abundant natural light to two levels. The inviting LIVING ROOM features a wood/gas burning fireplace with beautiful stone mantle. A glass lantern hangs from the rosette; Roman shades adorn the tall bay windows. The elegant DINING ROOM is embellished with wainscots, beaded glass chandelier and wall sconces. The Powder Room with pedestal sink & marble surround and guest closet are located off the foyer. The spacious, open KITCHEN with BREAKFAST AREA & FAMILY/MEDIA ROOM comprise the heart of the house for wonderful, informal dining and entertaining. The gourmet cook will enjoy preparing meals while socializing with family and guests in the well-planned, fully equipped custom kitchen. The oval skylight floods the upstairs landing. The bedrooms feature tall ceilings, custom window coverings and hardwood floors. The MASTER BEDROOM features a fireplace with mounted flat screen television, picture windows with wonderful garden outlook & sliding doors to the large deck with attractive trellising. Side-by-side closets and a dressing area with pull-down ladder to attic for extra storage. The sunny, south BEDROOM has charming bay windows and hand-painted fleur de lys borders. A large closet accesses the attic for additional storage. The adjoining BATHROOM has all-granite surrounds and similar all-Kohler installations and finishes as the master bath. A charming middle BEDROOM completes this level. Descend to the lower level via the family/media room to the spacious AT HOME OFFICE/PLAYROOM with ample built-in cabinets and workspace. The LAUNDRY area contains a side-by-side washer & dryer, ample storage & folding table. The GARAGE can accommodate 2 to 4 vehicles; the custom fabricated garage door is beautifully integrated with the period façade. There is ample space for an AT HOME GYM which is the current use.